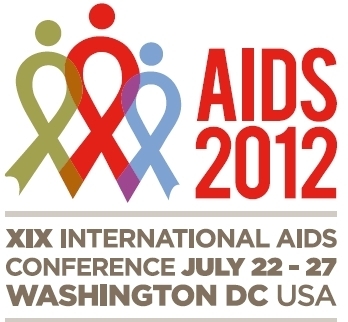 This past week, the 19th International AIDS Conference was held in Washington, DC. Thousands of scientists, policy makers, researchers, patients, advocates, and activists gathered in the nation’s capital to engage in fervent discourse about one of the world’s deadliest epidemics. As with any event like this, there were certainly critics who believed the conference was all talk and no action. They cite the Obama administration’s decision to cut AIDS funding by $214 million for the fiscal year 2013 as well as the ongoing stigma that plagues the lives of many with HIV or AIDS. “People still think of it as a shame-based disease. It’s a sexually transmitted disease, and you’re either gay or you’re a prostitute or an intravenous drug user. And so a lot of people are still very bigoted about this disease, and it’s our biggest opponent, trying to break these people down. It’s such a treatable disease. … The end is in sight for this disease, medically. 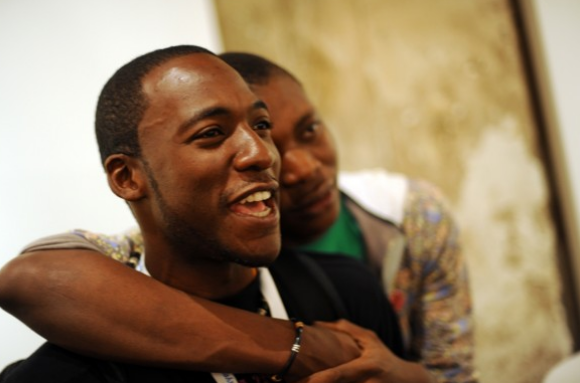 Moreover, for African men like Teah Wright of Liberia and Michael Ighodero of Nigeria, shown below, the conference gave them an opportunity to embrace their sexual orientation – a luxury not usually granted to them in their home countries, where fear and stigma often prevent the open expression of one’s sexual identity. In addition to progress made regarding the psychological and emotional burden of HIV/AIDS, the biological fight against the disease is also proving to be more successful than ever. According to this article from The Economist, the annual cost of treatment has dropped from $10,000 several years ago to $200 – a significant achievement. The most effective treatment discussed at the conference thus far has been combination therapy, which involves taking multiple antiretroviral drugs simultaneously. This way, the virus is attacked on multiple levels, reducing its potential to harm the body. Circumcision was another, albeit controversial, preventive measure discussed and debated hotly at the conference. According to the same article, circumcision has gone “viral” in Africa since studies in 2006 showed that it had significant effects in reducing infections. In addition, Bloomberg Businessweek reports that evidence presented at the conference shows that “a circumcision program in Orange Farm, South Africa, may have averted 536 infections last year among 52,000 men there.” As helpful as it has been, it has been raising much controversy for reasons having to do with infringing upon freedom of religion as well as boys’ right to make their own personal decisions about their body without pressure from parents. Read more about it here. 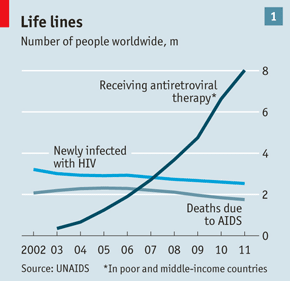 Many say the fight against AIDS has been the one of the most successful achievements in public health in our era. I personally agree with this statement, given the amazing contributions made by doctors and researchers who have been enormously successful with antiretroviral drugs as well as the promotion of contraceptives. However, social stigma is still an issue for many of those afflicted with the disease, and as Elton John said, despite the fantastic medical progress, the fight against HIV/AIDS cannot and will not be won until prejudice is overcome as well. What were your opinions of the conference? From what you have read/heard about it, did you think it was effective? If not, what more could or should have been done?